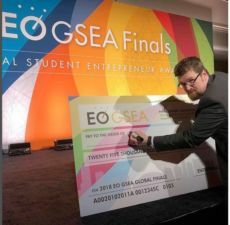 I had the wonderful privilege of serving as a judge once more for the Entrepreneurs’ Organization Global Student Entrepreneur Awards (GSEA) Global Finals in Toronto last month. This competition involves more than 2,000 student-entrepreneurs representing 56 different countries who competed for one of the 56 semi-final slots. Students must have a business that generates $500 or more annually or has received $1000 in investments when they apply to compete. The first-place winner of the Global Finals receives $25,000 in cash, and a total prize package worth over $40,000, not counting the free media exposure that follows. All of the contestants receive invaluable feedback and mentoring from the judges as well their peer competitors. I interviewed three of the semi-final contestants, all of whom I judged as part of my group of semi-finalists, including the Global Finals winner, 25-year old Axel Garcia. Axel is a graduate of both Embry Riddle Aeronautical University and EPF Graduate School of Engineering in Sceaux, France. He is the founder of PRatian, a company that makes biodegradable beads, HydroPearl that provide water and nutrients for plant growth that is a more sustainable approach to plant irrigation and fertilization. Samuli Taskila, 26, is a sixth-year law student from the University of Turku in Finland. Samuli is the co-founder of Entis, short for Entomophagy Solutions Ltd. The company makes chocolate-covered crickets as an alternative food source “comparable to meat in their nutritional value.” Hong Kong Polytechnic University graduate Davon Hui is the co-founder of Sightecho, “the world’s first smart diving mask with augmented reality.” As the GSEA competition criteria focuses much more on the entrepreneur than the business idea, I wanted to learn more about what inspired them to become entrepreneurs, how they built trust with their key stakeholders, and what advice they had for other student-entrepreneurs. Axel said that, “he has always been fascinated by space. It was through my early NASA education that I realize I could use my skills in mitigating environmental issues in space to solve issues of droughts worldwide. Therefore, PRatian (also known as Puerto Rico on Mars), is the legacy I want to give to the world, as we are a strong R&D platform that creates space technologies to solve global issues.” Davon found that “entrepreneurship is the solution to most of the existing problems we face. By taking a leadership role in the society, I can solve issues that really matter to people I love. When he ran out of air on a diving expedition, only the proximity of his dive master saved him from disaster. For Samuli, developing a solution to the world’s growing need and demand for protein that was environmentally sustainable motivated him to create his product and launching his company. There is a point at which every entrepreneur experiences despair. Mine came on 20 September 2017, when Hurricane Maria decimated the island of Puerto Rico. We lost hundreds of lives. We lacked the food, water, and electricity to function normally for more than five months. The crops we were growing as proof of concept for Hydropearl―$40k in valuation―were completely destroyed. Our company lost employees who went to help their families or left the island in search of alternative income. This experience taught me the importance of having an international team. I asked team members who lived outside of Puerto Rico to write grant proposals to help cover some of our losses. Team members who remained on the island helped me re-start the process of validating Hydropearl for industrial farming use. Before the legalization, we had some serious obstacles. There was a lot of uncertainty about what could be done and what couldn´t be done. For example, we had a lot of insect food tastings that were okay with local food authorities. Then last summer, we were supposed to have our biggest tasting in a big music festival, but we suddenly got turned down by local authorities. However, we got a lot of media attention for that and all of that work was one of the reasons why Finland legalized insect food in September 2017. Davon stated that “one of the obstacles I had was assembling the team. It takes time to convince great people to join and follow you. I strongly believe that every one of us in the founding team will be a successful entrepreneur separately but we decided to group up. Also, the product development process for hardware is much longer and it takes a longer time to gain feedback from potential customers. Need Help Starting Your Entrepreneurship Journey?